I recommend you watch this video through once – there is a lot to think about in this short video. Then read the notes underneath the video for how best to use this video in conjunction with the training guide below to get the promised result. Negativity is about as far away from where you want to be that there is, so disposing of negative thoughts is probably one of the most valuable uses of your time. Consider, do you allow yourself to be around negative people. Consider, do you think your life would be easier if you didn’t allow the negative thoughts of others to slow you down. Consider, do you think you can create happiness from a negative state of mind. How does it feel when you consider this. Consider, how are you negative when you’re on your own? Consider, how are you negative when around certain others? Consider, how do you think this negativity is helping you? Consider, are you addicted to negativity? If you are or you are and you don’t want to admit you are, then just go and ask the question and see what answer you get. If you get an answer in words then that is your ego, if you feel an answer, then that is the truth. But you are not there to judge, you are there merely to observe. Consider, do you really want positive change, or are you afraid of it. No one is watching you can feel the truth for yourself. Consider, do you think that your negativity is killing off you really living your life. Consider, if you ‘believe’ you can have lasting happiness and still remain negative. Look for the next time you are negative (it won’t take long) and then go inside your mind and ask why. Just observe what you did, don’t attempt to judge it, just recognise the benefit or rather the fact that there is no benefit for you. How does this statement make you feel, ‘You cannot create the life you desire and allow negativity into your life’. Consider, if you wish to be successful then you have to either give up your dreams or give up negativity – Consider how this makes you feel? If you would like to remove negativity from your mind then there is a lot for you to consider here. However, there is no rush to do it. As anything you build on top of negativity will eventually come crumbling down. You first remove negativity and then you begin to build, so each of these you will probably want to consider… SLOWLY. Remember: The purpose of these videos is not to overwhelm you with information. They are there to guide you to the right way to think instead of the wrong way. You have been taught by schools to cram in information, however, your results will show you if you care to look at them that this does not work. So cramming will not work here. What will work is you disassembling your thoughts and almost effortlessly constructing new ways to think. Thank you so much for this segment! I’ve always had a great aversion to negative people, it’s almost like I have to get away as fast as I can before their negativeness smothers me like a huge black cloud. And, when circumstances don’t allow a fast getaway, I’m in a funk for days! Yet, as much as I detest it, I quite often do fall into that pit all by myself – then it is a real struggle to pull myself out. I really like your ‘observation’ suggestion, it makes huge sense because what we resist gets stronger, so just witnessing without judgement sounds like a perfect solution. Thanks!! this video left me smiling at the end. I have a long way to go, but it feels more possible then ever to be successful, in every area of life. Superb.. Video is defo a great format for getting info across and you have clearly put a lot of work into this. i am about to start writing my book (at last)- i have been writing it internally for sometime now. Its titled “You Become What Practice”… Which is what i would say to anyone doing this course- its all there for you to transform for life but as with any skill it take practice. Oops – You Become What You Practice. A special thank you for sharing this new insight into our minds..
Look forward to the launch.. I have been observing (I call it the witness consciousness) for quite a long time and have become increasingly aware of trying to save people – It is insidious and it manifests in a number of ways, for instance I might try and take someones experience =away from them by trying to make them feel better so they don`t have to deal with their negative feelings. I try to make sure I don`t upset peoples egos, Oh dear, Oh dear the list goes on and on – and I feel such a massive guilt when I come home to myself and stop focusing outside on other people and what I think they want and need. It`s like I am respoinsible for them and how they feel. In a way I suppose I let people feed on me – once I saw this then gradually this painful darkness I was living in bean to show itself. When I remember to see reality as it is and not how I want it to be that is wonderful but difficult to sustain at times. Thought I`d like to share this with you, but nearly didn`t. All the very best in what you are attempting to do..
Well Andy, Your books are very good and used with the audio’s I have learned so much about my mind set. 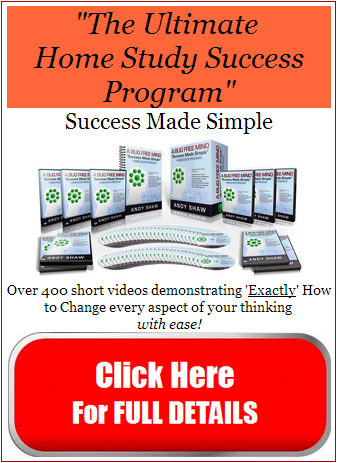 I know these videos are going to hit these lessons home and eliminate any doubt that I may have of being able to stay in control and achieve my success. I have the odd second or two of negativity and it is so destructive but you have found the antidote for sure. BRILLIANT FOOD FOR THE MIND Thanks again for all your effort. Hi Andy, this video in combination with the list is so much more pin pointed than in your very, very first book. Fantastically explained- thank you :-). I was fortunate to have instinctively sensed in the past that negativity isn’t good (despite my terrible past) as I have always felt ‘drained’ and ‘robbed of energy’ after I had a negative go at someone or about something. Your teachings came as a blessing and I can’t remember now when the last time was that I have felt drained or robbed of energy or negative. I have managed to cut all negative friends out of my life and if I meet new people who could become friends I observe them and when I notice that they are negative I let the relationship ‘thin’ out without me being affected as I have made the expereince that for every negative friend that I have turned my back to I have made three new positve friends who make me feel good and happy and who I can share experience with as they all students of your bfm techniques. Of course I come in contact with negative people due my work and during shopping etc but it doesn’t affect me…I can see how ‘insane’ and isolated their thinking is when they are in a negative state of thinking and I seems like someone else is taking over inside them. Something, that seems to control them like marionettes- which is of course the ego. I used to fight that bug and the negative (sh#$%t) he filled my mind with, but he always won and left me miserable. Now I just smack him with 15 seconds of my most beautiful thoughts and he runs away and leaves me in peace. If he shows up again I do the same thing, The little bug is not so powerful any more and some times he leaves me alone all day long. Hi Andy, yes I try very hard to avoid this black force, successfully built up my business as a freelancer, while directing the life-path of my two wonderful teenage daughters as a single mother – but how do I deal with my widowed father, now 85, who has been living with us for some years now. His negativity, of course linked to ego, knocks holes in my energy every day, which I don’t know how to avoid. Watching or reading the news also tests my resilience. We seem to be surrounded by negativity (of course it keeps poeple subdued and compliant) and the battle to keep it out of our lives takes up so much energy. Yes, I try to see it as insane – but the constant drip of water wears a hole in even the hardest stone. You can’t change what is. But you can change how you allow him to affect you. Slowly repeat the video and consider the items listed below it, one at a time. The more time you spend considering these then the easier it will be to detach yourself from his negativity. I personally would use humour and be sarcastic when he is negative. As for watching the news, I avoid this other than when I want to test my presence and awareness. However, if the constant drip, drip is the problem then the way to handle it you can find within yourself just by using the sign posts I’ve given you below. Thank you Andy for the negativity video. I watched it and saw myself deeply burried in it. I have to fight it hard until it is overcome. It is really so simple, think negative thoghts and negative things will happen to you. Stop thinking negative thoughts and negative things will stop happening to you. Perhaps it is too simple, but it is also very genius. Thank you for the video on negativity. I am committed to let go all negativity for it does not help me to achieve my goals. Keep up the good work. Dear respected Sir Andy,words will not be enough to thank you for contribution to my world.Regards and best wishes.A.David. Hi Andy, I must be getting A LOT more honest than I was before starting on ABFM, ’cause I’m able to spot so much negativity in my life. I don’t know whether to laugh or cry. Was I always this much of an old grouch? (I say that tongue in cheek) I am, at any rate, continually grateful to you. This is making a big difference in how I live my life. And, strangely enough, I find my commitment to the process growing instead of diminishing. Thanks! Andy your videos are great – so simple and you can’t help but laugh even tho the subject is so serious. I am still encountering spectacular resistance to getting to where I want to be but I am aware of it and am turning it around to my advantage. I know that my ego will get the message soon. Laughter is a sure antedote to this insane disease. Love and light. Laughter literally robs your ego of it’s power… When you can actually without effort laugh at yourself for the insanity of certain actions then you begin to gether ground a lot faster… Up until that point you are putting a lot of effort into it, and when applied correctly structured thinking should be effortless. Very relaxing and must work more against negativity. Pragmatic clear view, you identify the problem, treat and move on. Looking forward to the cure. I love it! and i have a nother question will you offer your books again to buy it because we didn’t buy it last time and of course we need it before feb. as the succeed will not wait us until feb.
You watch it as many times as you feel the need to watch it… Some videos require only one pass through, others you may want to watch once a week for a year, and then ocassionally. It all depends on what bugs run deep in your thinking, and we are all different. The books will go on offer again in Feb, but I have no plans to offer them again before that. We keep some back for our existing clients or for people who purchase our other products or services, but apart from that, no not until February 2014. I have discarded ego from my life, but it creeps in for the sake of our family of 6 that are my son & his wife, my daughter & her husband, wife and self. This negativity video has awaken me to watch for negative moves in them (my family) and let’s see the outcome which I shall surely bring to your attention if seen. Maybe whatever negativity I see in them does dwell in me too which has been dormant until now!!?? This video and this article of mine has done me right, thanks to you Andy, and God bless you. I want to thank you very much.These videos you send me ,help me very much.Best wishes. I have been working on living in the present for many years and do practices that stop my ego from dragging me into negative situations that only bring about negative results. My understanding is that the same greatness dwells in each one, we have to recognize our true Self and not allow the ego to run rampant. I love your teachings they do lead in the right direction and inspire each of us to continue overcoming our illusions and recognize the great being that dwells within. These teachings are a huge benefit to everyone – thank you Andy for your positive commitment to the truth and helping us realize that this world is indeed a paradise. Great video, its timely and helps me a lot, thanks for sharing. Hey Andy; Just finished watching this video,, it certainly hit the right spot. I have really learned a lot from these videos. Keep up the great work. The use of negativity is surely to alert us to problems we need to solve. Having recognised these, we simply need to get on with dealing with them. If more negative thoughts always follow, or if the negativity makes us afraid of even tackling our problem, then there is an underlying bug that needs fixing. All power to you, Andy, in your no-nonsense, hands-on approach to getting rid of these underlying bugs. I beleave you have attack the real problem for personality development.Nobody can progress by being negative.Thanks ,blessing and love for you. How about you look at it from a more simplistic angle… Look at Donald Trump as a 3 year old, just protecting his toys… He has just not lost touch with being a benefits driven creature, which we all once were. He is doing what is best for him, how another views that is down to them… He is just doing what he wants and using all of his ample skill set to do it. You talk a little too fast and your accent is sometimes a little hard to understand – for us who are not native English speakers. Fantastic !!!! Thank you Andy !!! This is a great video as it really makes me THINK about the negativity in my life and what good it is doing me (none at all). Negativity can slide into my life especially through television and the newspaper so i avoid these as much as possible. Even though I have had people say to me that I am he most positive person they know I can sometimes find my self slipping into negative talk when conversing with negative people. Now that I am aware of it. I find myself questioning why i am doing it and therefore reducing the insane behaviour. Still a bit of work to do on this one though!! What should we do if we are surrounded by seriously negative people in our workplace? I cover this in detail in the site as it’s quite a common question… But basics are firstly to fully accept them for who they are and their negativity, fighting this only results in an increase in negativity. It is after all not their fault that they are negative, they were just never taught how to not be. And neither were the people who taught them… Then there is also the following the crowd at chow time issue… When surrounded by negativity we without thought consider it normal and copy them. The next thing is to stop looking at your situation as a bad thing, when you can see it as an opportunity to be the light, be the change you want to see in your world. Then those negative people now becoming training equipment for you. Getting your head or rather your ego round this can be tricky. But if you make a decision that those people do offer you an opportunity to learn and grow, then all of a sudden you have become an alchemist, turning a sh*t situation into a golden one. There’s more, but if you just practice those you will see an instant improvement in your life. Your advice opens my heart, clears my mind, to look at things in a different perspective. Now, I have to practice my awareness and courage to move on, courage to come out of my own negative mind, and not to let the build in negativity stop me from every aspect of my life any more. I have not been earning income for over ten years, my lifetime pain has stopped my life, now I need to move on, to regain my life and reach my goal. You are so right about its addictiveness. I am much more aware of my thoughts, judgements, feelings, etc. Sometimes though, because negativity is a habit, I have to work hard to stop myself making a negative statement – that’s after I’ve already thought it! I find laughing at myself and the stupidity of negativity helps. Also, I am very aware when I am in the company of the habitual negative person and find it much easier to not allow myself to get drawn into a negative ego fest!! Very entertaining Andy; thank you! These posts and videos and thoughts you share are wonderful! Full of wisdom and truth. They are very much appreciated!! Dobrý den z Evropy – Česká republika. Hello from Europe – the Czech Republic. Great Video! Looking forward to more! I think I see your points… Results are what will sell me on the process. Again, it all looks Great. As I am hearing impaired and my mother tongue is Malayalam,I could not read fully and grasp the ideas before moving the script.I can talk.Anyway I asked my friend to buy one copy of your books and send to me.My very deep intrinsic motive to succeed in life lead to you.In fact,I could not read fully the first 10 chapters of your book.I am stubborn to overcome all my problems.Thank you. Very useful tool you have elaborated. Being a trainer I often try to learn and teach how to over ride to negativity. Thanks a lot for the tips. Thank you very much ! I knew this but the way you explain makes it clearer. Well said, Great video !! Thank you so much for letting us access this infromation. It came just at the right time. It helped me a lot because it caused a great deal of awareness about my way of thninking. You are a great coach! This video is really special. As a young man I always knew that negativity never lead you to a good place so I put it out of my life(completely or at least I thought) and I was the happiest and most positive person you could ever meet. I was Mr. Enthusiasm and very happy, however somehow, at some point in my life things changed and I started to become negative more and more and started loosing all the good things in life. Now I know it was because I did not have a System of Structured thinking sort of like the Anti-Virus program that you talk about. Now i know how important it is to have one. I am very interested in your system please let me know whats the next step. Thanks Andy, Really enjoyed it and absolutely agree about removing negativity. I was loving the video right up until Donald Trump appeared. He is a very negative, mean man and very poor example. He is proof that negativity does exist in successful people; effectively negating the positive message of the video. Choose your examples wisely. I respect your opinion but disagree entirely, he just knows what he wants and goes for it… This often means he tramples on people and as such I can understand your opinion. But he himself is not negative. Indeed he is extremely positive and is so with ease. We can learn from anyone despite what we may have thought of them. I also avoid judgement and rather go for dislike or like as judging someone often proves to be wrong. So I see little point in judging when I have no need to. Yes Andy, the video is spot on, I’m going to read the notes now. Thanks again for all your free stuff. I’m looking forward to the arrival of my book. Thank you again i now am seeing my negative has an angle to keep me there. I love it. It confirms the things that I have been doing naturally. It’s really good stuff to ponder upon! Thank you, Andy, for all the information you’ve been sending me. It is indeed very interesting. What I particularly like is the way your videos are made – very attractive! Of course, what you say about negativity is quite true. I myself am not a negative person, on the contrary, sometimes I think I am a bit too optimistic. But yes, unfortunately too many people are negative and one gets carried away by this mass negativity. Once again, I find most of the information quite helpful! Thanks! Thanks Andy your books and audios will help me to achieve my dream. Andy I just love the way your teachings are so clear-cut; they slice through the gunge and leave a brilliant crystal of truth. Bless you for sharing!! Hello and thank you Andy very much for all the fantastique material you’ve sending me,13 days now & what a wonderful journey it is.This video reminded me never to underestimate the insidiousness of the bug negativity,it’s addictive nature that gives amnesia to natural mindset,destroys the body and mind,bankrups the spirit. I am grateful,more than words can say Andy,for your sharing truth,simply,wisely,Teaching me How to Structure Thought and Live BugFree ! Cheers Andy !! I recognized my negativity and would ask myself why when something would pop into my mind and stop thinking about it but it or some other negative thought would then enter! I know I have to cure this to get anywhere! greatly and for this I am forever grateful. All your teachings jive perfectly with my Buddhist teachings. I appreciate everything you are doing for the Human Race. Salutations! Andy, in corroboration (confirmation) of your words about knowing and don’t knowing. Knowing and using is completely different, it is like wanting and having. I know about something and yet I found I’ve forgotten it. Here’s example. We have lost sight of our mastership, and have deluded ourselves into thinking that we’re victims in a world that controls us. It is not so! WE ARE causing what is happening to us by giving power, our power, to the external world. Cause of virus of negativity we can not generate enough of positive emotions. WE DON’T GENERATE ENOUGH OF POSITIVE EMOTIONS so we’re not able to create anything. I should STRIVE to generate enough of positive emotion and taking responsibility of what happens into my inner world. So I added playing ping-pong. It makes me happy. Posting comments too! Thank you. Kind regards. Ukraine.